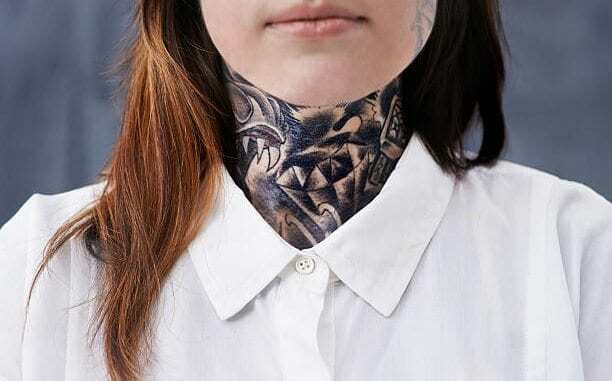 Neck Tattoo Safety-Dangerous Or Not? Neck Tattoo Safety, Many people, have designs on the front or the back of the neck. Is this serious? It's not dangerous, unless, you go to an unseasoned tattoo artist. If getting a tattoo on the throat was threatening no tattoo artist would make them. The only 'risk' of getting a tattoo on the neck is that it may be unpleasant for some people to manage. Before getting a tattoo, be sure you have a high pain threshold. When getting a neck tattoo, it may sting you more than it would somewhere else on the body. You may want to talk to and question the tattoo artist before you decide to have a tattoo. Take a moment to think about it because once you get a design, it won't come off with rubbing alcohol or soap. Be sure you don't have any allergies to ink or other tattoo materials. If you have allergies, you might have an allergic response to the ink. Chat with a tattoo artist and inquire about the ink. What's it made from, plants or chemicals? What brand of ink is it? A reputable tattoo artist will be more than prepared to answer your questions. Don't feel stupid about it because it's your health which is crucial. One of the tattoos you choose for the back of the neck may be too large. Did you decide on a butterfly tattoo which may sound too cliche? OR did you pick it because you like the look? Is It's a tribal butterfly tattoo, and the eyes look like they're watching you. It may symbolize someone These are the things you must consider before making a decision. Neck Tattoo Safety-Does It Hurt? The only unpleasant experience of the tattoo may be when the tattoo artist removed the tattoo stencil from your neck. You need to look at the placement of the symbol in the mirror to be sure of the arrangement. My tattoo artist took alcohol to erase the stencil from my neck. This removal tingled because she shaved the hairs around my neck before putting the stencil on me. Fortunately, when she put it on the second time, the position was perfect! Neck Tattoo Safety-How Dangerous Are Neck Tattoo Designs? A neck tattoo can be hazardous to your job. If you work at a corporate job or workplace that grimaces upon body art; your managers may not relish the design on your neck. Verify with your company before you get a neck tattoo. Nevertheless, you may be able to get away with a tattoo on the back of your neck if your hair covers the area. If you're a female, you won't be able to wrap your hair in a ponytail or other styles that expose your neck. This matter is something consider about before you get a neck tattoo. If you desire a tattoo on the back or side of your neck, make sure you're positive about it. Talk with different tattoo artists and pick one that's best for you. Make sure they operate at a famous shop and ask them about the equipment, particularly the needles. Select a tattoo that has a genuine meaning to you because you won't be able to remove it the next day. Follow the care directions from your tattoo artist and your tattoo will last a lifetime. Custom Tattoo Design Stencil-What is it? Christian Tattoo Bible Verses-Should Christians Get Tattoos?